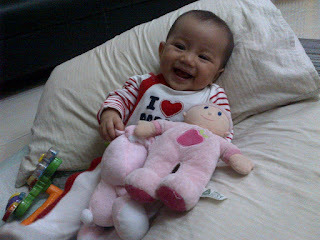 When Babycakes was small, I bought her a pink doll whom I named Pinky Polly. I wanted Pinky Polly to be her lovey, her best friend, one that she would get attached to, one that she would bring everywhere she goes. Pinky Polly did have her fair share of story. This was when Babycakes was only 4 months old. She's oblivious to Pinky Polly's existence at that time. As she grew older, she started to have an obsession with teddy bears, whom she fondly calls Abik. We've taught her to say bear but she still says Abik so Abik it is. This is Babycakes with her many soft toys. 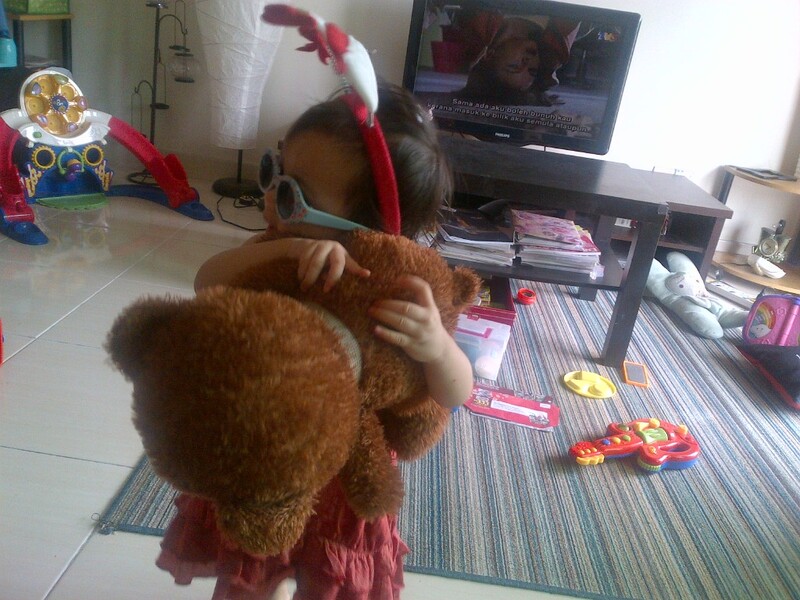 She has a pink bunny (we call it bunny rabbit hop hop hop), Tony the turtle which Daddy got for her in Sabah, a Harrods teddy bear, a few McDonald's teddy bear from my collection and a few other teddy bears which I used to put in my car. 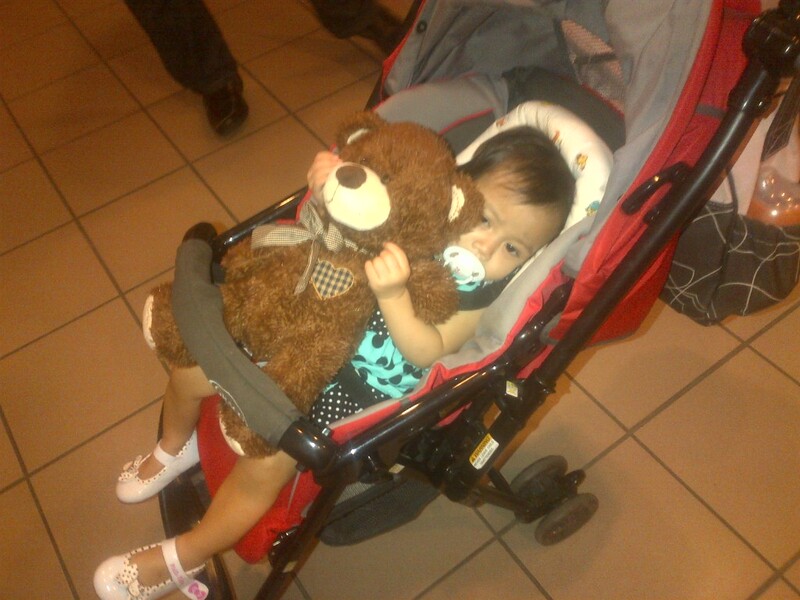 She received the big brown teddy bear for her birthday. She has no particular favourite Abik. She loves and adores them all. She would pick any Abik by random and take Abik wherever she goes. This was when we went to Starhill for dinner at Jake's. Abik is just as big as herself. This is the Harrods Abik. Abik joined us for breakfast at Restoran Bistari, Solaris Mon't Kiara. She loves all kinds of Abik. Big, small, brown, pink, white, red, purple. 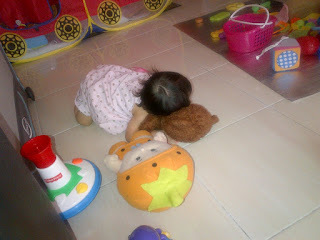 She kissed this purple Abik at Jkids Playground at Tropicana City Mall. 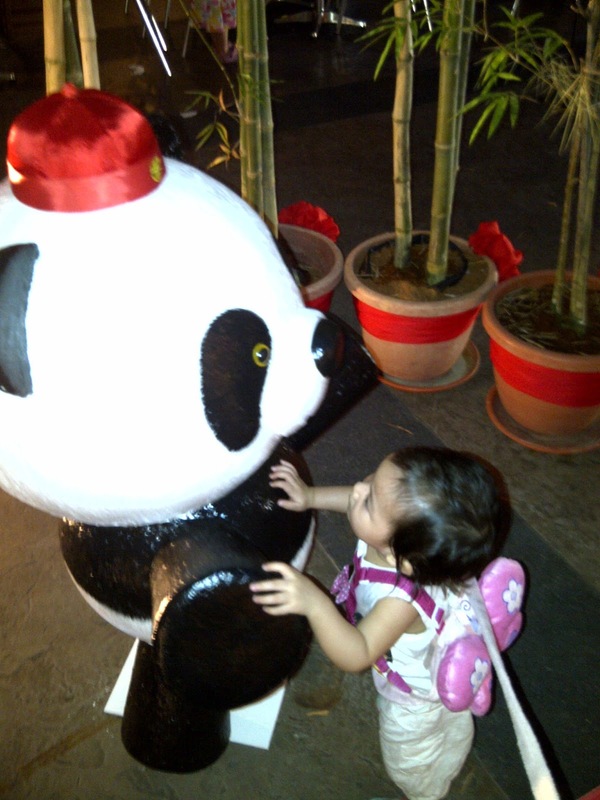 This panda bear was part of the Chinese New Year deco at Desa Park City. She literally ran and screamed "Abiiikkkk" when she sees it. We put on the safety harness on her for safety purposes but also because the park is a dog-friendly park so there were many people walking their dogs, on leash of course. I was the one who's scared when a dog comes near me. Babycakes was excited looking at the dogs that she wanted to touch them. You can guess who freaked out. I can't help but feel like I am walking my baby, with the harness on. -_- But then again, it's for her own safety so screw what other people might think! This was at home. She was testing her sunglasses. I bought the sunglasses at Mothercare when it was on sale. She was barely 3-4 months when I bought it. Now she's big enough to wear it. It's also one of those days when she doesn't mind wearing a headband. It's a Christmas headband with the heads of snowmen. A waitress at Magnificent Fish & Chips Restaurant gave it to her when we dined there sometime before Christmas. This was at my parents' house. 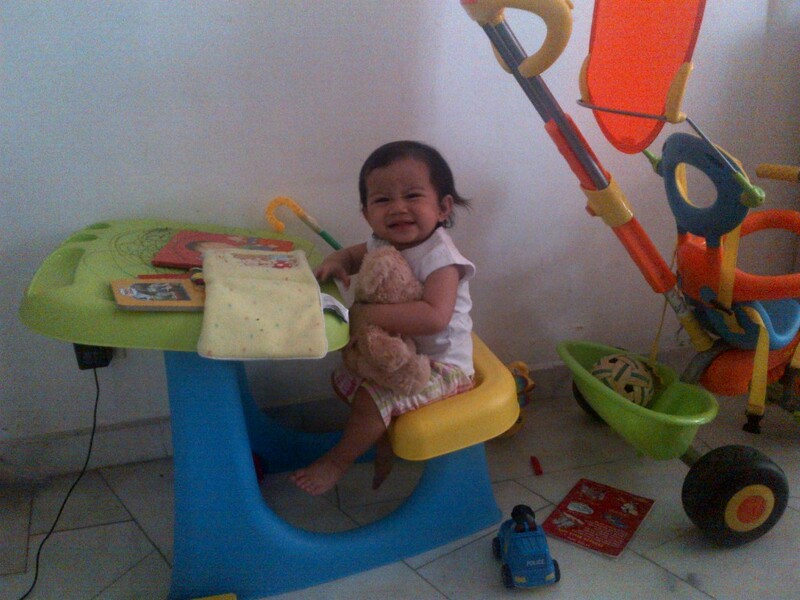 Abik is with her almost all the time, even when she's 'studying'. She was cheeky enough to give me that cheeky smile when I said "Mummy take your picture!" One time we left my parents' house without Abik so my Mum called me and said "Abik tinggal!". Daddy had to turn around just to take Abik home. That's Lola with her. It's a mushroom-like doll we bought in Cameron Highland. Of course I came up with the name Lola. Now she calls her 'Lala'. Close enough. Again, that's Lola and the big brown Abik. Babycakes would sometimes bring Abik to the nursery too. 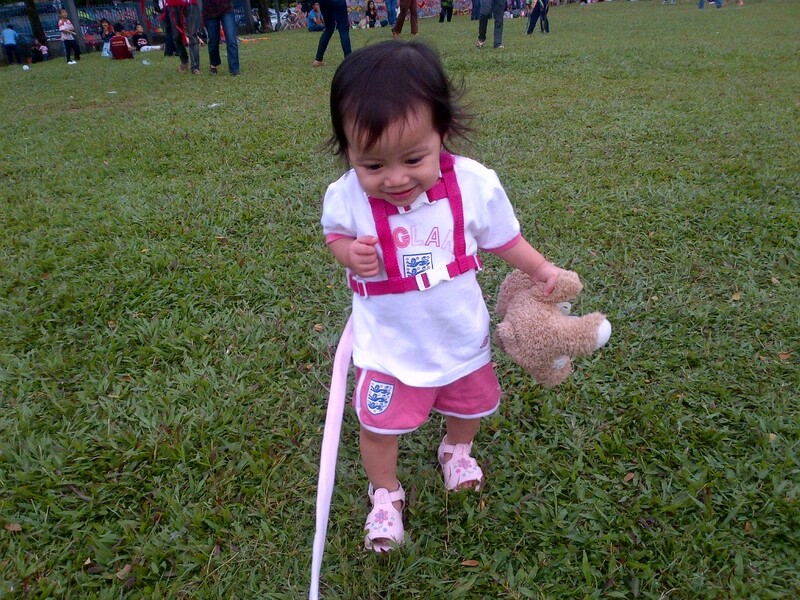 When I pick her up, sometimes Abik is not with her so I must ask her sitters "Hari ni bawak Abik tak?" I wouldn't know because hubby sends her. Abik followed us to Kuantan too! We followed my Mum to Kuantan on Hari Wilayah and we went to Pantai Teluk Cempedak. Abik got sand all over her. 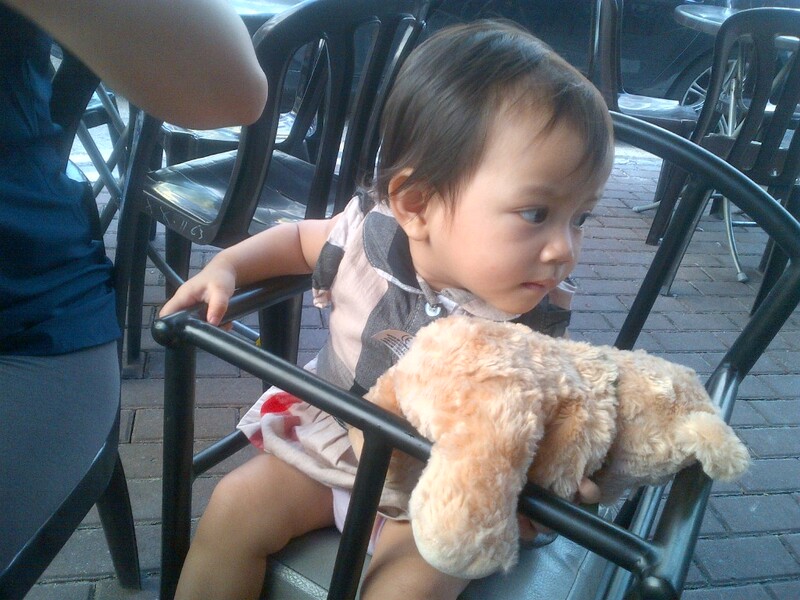 When we came back, I had to sanitize Abik by spraying some Euky Bear Eucalyptus spray. During the Chinese New Year break, we went to the Metropolitan Park in Kepong to fly a kite. Well, Daddy did the flying while Mummy had to look over Babycakes (and Abik). There were so many people that we just had to put the safety harness on. I dare not think how much germs this Abik caught. It sat on the road with her and it also fell on the grass. After that, we went to Tesco to do some groceries shopping. We assumed Babycakes was tired so we put her in her stroller instead of the shopping cart. As we finished paying and about to leave, I only realized that Abik was nowhere in sight. I panicked. I asked hubby, "Mana Abik?" He was like "Eh ada Abik ke?" -_____- He said he didn't see Babycakes holding Abik but I remembered giving Abik to her earlier. Believe it or not, I actually went in and literally combed the whole of Tesco including the lower floors where we went to ATM, just to find Abik. I went to each and every aisle, I looked on the shelves, in case someone found her and put her on the shelves, I even looked into people's shopping cart, in case their kids found Abik and wanted to take her home. However, I could not find Abik anywhere. I was devastated. Thankfully Babycakes do not have a particular favourite Abik so I can be rest assured that she can still sleep at night, with other Abik accompanying her. I went to the information counter and left my name and number and told the staffs to call me if they happen to find Abik. Until today, I still do not hear anything from Abik. Poor little Abik. I wonder where she is now. 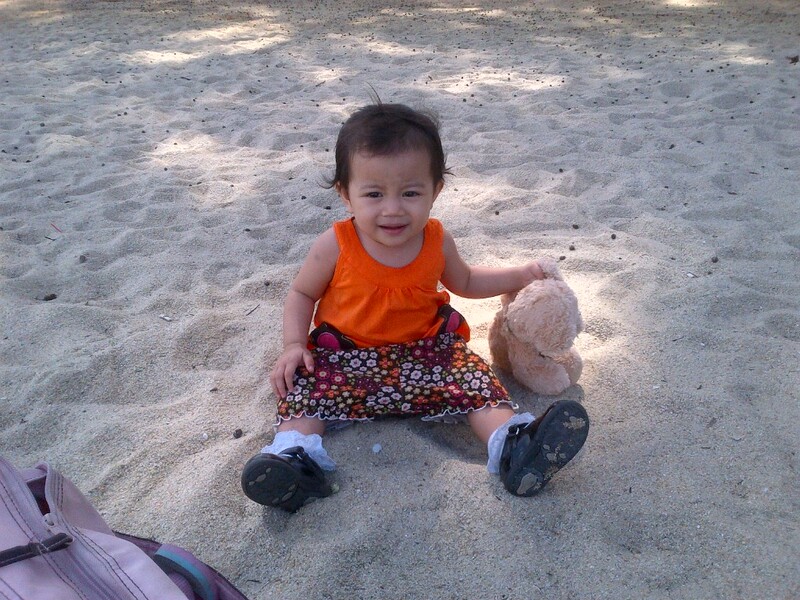 Even though Babycakes has other Abiks, it's still so sayang to lose one. I hope Abik is in good hands. So that is the story of Babycakes' Abik. Awww this is a very, very cute post. 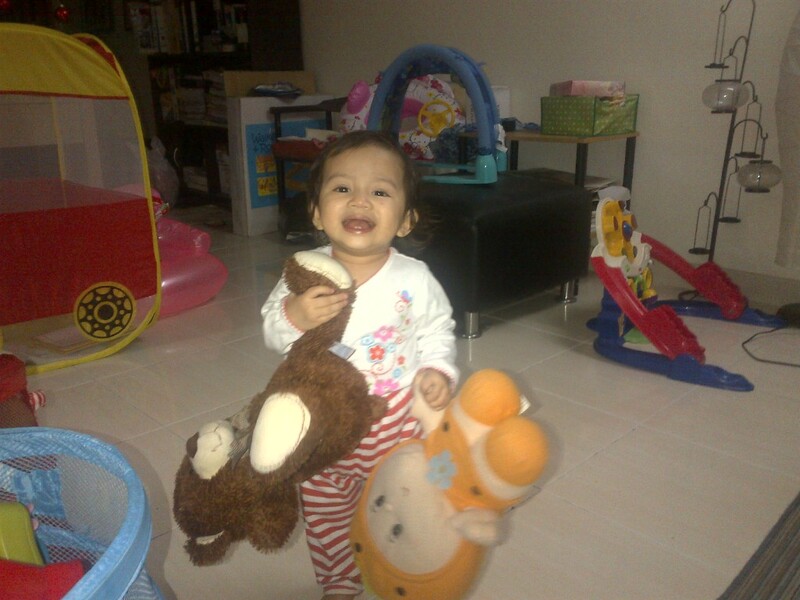 :) looking at her pics made me smile from ear to ear. Thank you for your support on Euky Bear's product.